Mix the cake batter according to directions on the box. Pour 1 cup of batter in a small mixing bowl and mix in red food coloring. Pour 1 cup of batter in a small mixing bowl and mix in green food coloring. Leave the rest of the batter white. 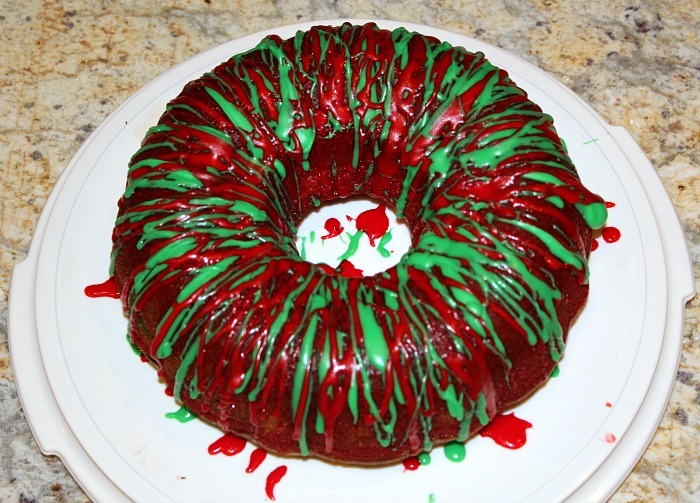 Pour all of the red cake batter into the bottom of a greased Bundt pan. Pour all of the white cake batter on top of the red cake batter. 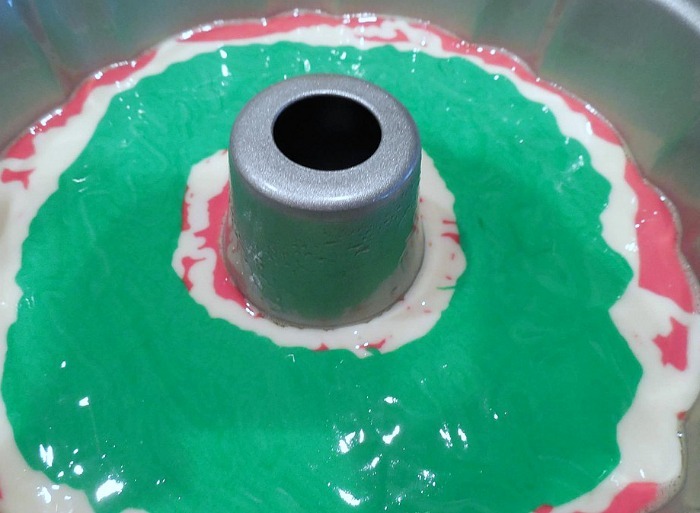 Layer the green cake mix on the top of the layered batter in the Bundt pan. Bake the cake as directed. Allow to cool for about 30 minutes then turn upside down (on a cooling rack on a cookie sheet) and carefully remove the pan from the cake. Using a spoon, drizzle the frosting around the cake. Microwave the second bowl of frosting for 5 to 10 seconds. Mix in a couple drops of green food coloring. Using a spoon, drizzle over the cake and white frosting. Microwave the third bowl of frosting for 5 to 10 seconds. Mix in a couple drops of red food coloring. Using a spoon, drizzle over the cake. Top with sprinkles if you want! Allow the frosting to set before putting the cake on your serving platter or carrier. 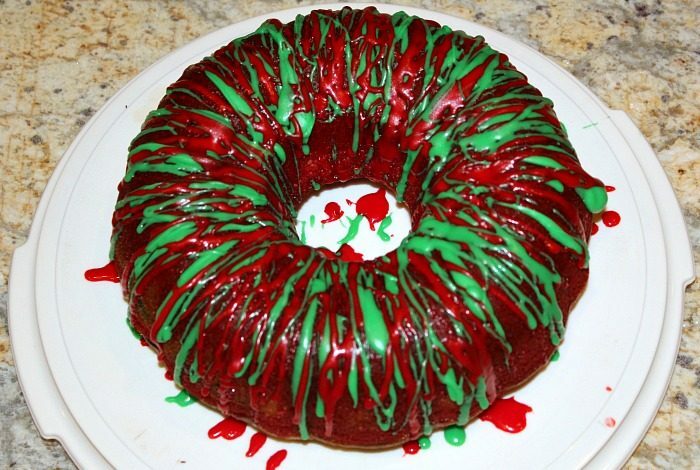 What is your go to Christmas dessert? 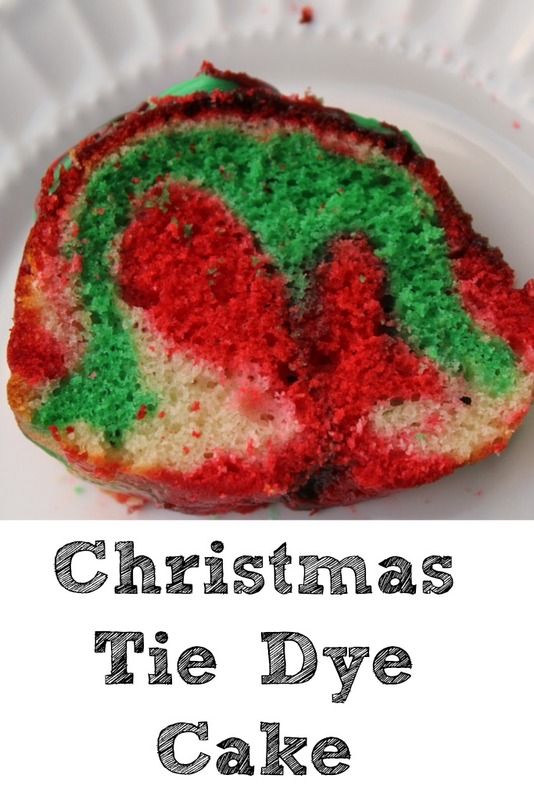 This Christmas Tie Die Cake is a great way to get in the holiday mood! The colors are bright and it's the perfect dessert for a family dinner or potluck. Mix the cake batter according on the box. Microwave the second bowl of frosting for 5 to 10 seconds. Mix in a couple drops of green food coloring. Using a spoon, drizzle over the cake and white frosting..
My go to Christmas dessert is Chocolate Truffle Cake. My family would stage a protest if I didn’t make it! 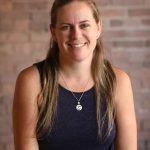 Thanks for sharing your links with us this week at Celebrate Your Story. This is one festive cake! Always great to see you miss!